Imagine: you are at the start for an international slalom in the heart of the Alps. 40 tonnes of water thunder past you every second, and you are in a little boat weighing barely 9 kilos. Your mind is so focused that you can't even hear the water. You are thinking only about the 18 gates that you must not miss. Above all, that key sequence, the one that has already put paid to some competitors' hopes after months of training. 5 beeps from the electronic starter. At the 5th, you're away. The first part of the course has been designed to tear your arms off. On the bank, your supporters are going crazy - but you can hear nothing. You haven't cleared one gate before you focus on the next. Half the course done. So far, no touches. Your arms are getting pumped, your body is steaming despite the chill of the river. Now, the key passage. Total concentration. One slip will destroy you. Triumph or disaster is here, and you know it. You're through. Rising confidence: you push harder still, though your arms are nearly paralysed. You must stay focused, you could blow it even in the last gate. And you are there. The final sprint. 10 metres to the finishing gate. 10 metres. Eternity. How did canoe slalom start? Where do I get entry cards? How hard will the course be? How do I get promoted - and what do I do then? I used to paddle slalom. Must I start again in Div 4? How do I get a bib? Where can I learn slalom, or start canoeing generally? You have to pass through all the gates in number order, and in the right direction. If you touch a pole with anything - paddle, boat, buoyancy aid, helmet or any part of your body - a 2 second penalty is added to your time. If you miss a gate out, or go through in the wrong direction or upside down, the penalty is 50 seconds - a wipeout in serious competition! The aim is fast and clean. Each competitor takes two runs, and the best run of the two counts. The gates are positioned to test your skill in using, and coping with, the water. This is perfect training for running big whitewater rivers. There will be an upstream gate to test your ability to break out into the eddy behind a rock; then a downstream gate the far side so that you must ferry glide or surf a wave to reach it before the river pushes you past. It takes skill, as well as speed. You must pick, and paddle, a line that turns the current to advantage. You must learn to read the water. Five classes compete: Men's and Women's Kayak, Men's and Women's Canadian Singles and Canadian Doubles. This is a sport in which Britain excels. Richard Fox was 5 times K1M World Champion. Lynn Simpson was K1W World Champion in 1995. Paul Ratcliffe held the K1M World Cup and won the silver medal at the 2000 Sydney Olympic Games. Campbell Walsh won the K1M silver medal and Helen Reeves the K1W bronze at Athens in 2004. David Florence won the C1M silver medal in Beijing in 2008. At London 2012, Tim Baillie and Etienne Stott took the C2 gold medal, only a fraction of a second ahead of David Florence and Richard Hounslow, who won silver. David Florence was C1M World Champion in 2013 and 2015. Florence and Hounslow won the C2 silver medal again at Rio in 2016. Joe Clarke is the reigning Olympic Champion in K1M, and Mallory Franklin is C1W World Champion. 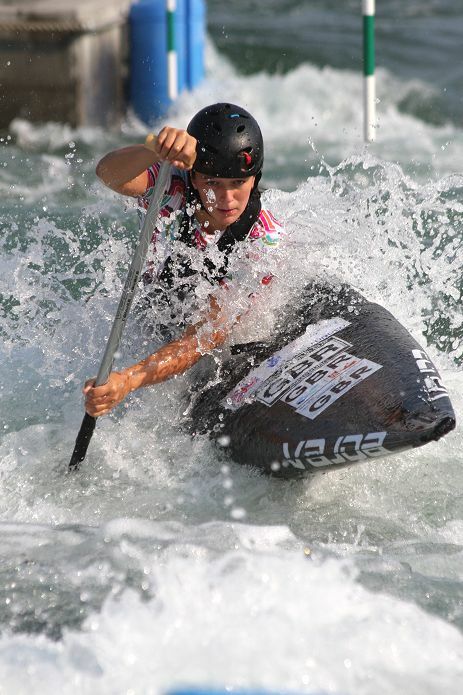 Whitewater slalom, which was originally modelled on ski slalom, began in Switzerland in 1932. Slalom canoeing began on flat water, but soon switched to white water rapids. World War Two set back development, especially from an Olympic point of view, but today both sprint and slalom are established Olympic disciplines. The sight of skill, strength and courage pitted against powerful water makes slalom an exciting spectator sport both live and on TV. For the competitor there is the challenge, together with fantastic friendships, cooperation between national teams, and a closeness to the river and the environment. The first Slalom World Championships were held in 1949 in Geneva. Since then there have been dramatic changes as folding and rigid canvas canoes have been replaced by composites and rules have been changed and simplified. In 1992 canoe slalom returned to the Olympic Games, in the fantastic atmosphere under the burning sun of La Seu d´Urgell in the Spanish Pyrenees. Canoe slalom is now an established Olympic sport and made one of the great spectacles at London's wonderful 2012 Games. It depends where you live. There are clubs and watersport centres all over the country, and some clubs have slalom teaching for mixed groups or for novices. If you haven't canoed before, a starter course is a good idea. Or you can join a club. British Canoeing can help you find one. The Slalom Year Book lists clubs that are active in slalom - click for a list. Lots of clubs have a slalom night when their slalom paddlers practice. You can also get lots of practice at competitions - there's always practice time there, and other people to watch. There are races for one-person kayaks and for one-person and two-person canoes - Men's K1, Women's K1, Men's C1, Women's C1 and C2. A K1 is a one-seater kayak - you sit in it and use a paddle with blades at both ends. A C1, or Canadian, is a boat you kneel in, and use a one-bladed paddle. A C2 is for two paddlers, kneeling and with single-blade paddles. Paddlers of all ages compete together, but there are usually special prizes for the best in each age group. There is a women's class for one-person kayaks, and one for single Canadian canoes. Women can also race in C2, but they compete with the men on equal terms. Apart from Veterans, paddlers of all ages in a division and class race against one another, but usually there are special prizes for various age groups. If you will be 35 or older on 31st December this year you can claim Master status (it used to be called DV or Divisional Vet) but it's up to you. When you apply for your bib you can "Opt in" as a Master or "Opt out" and be just a Senior. In team races, teams of three boats work together for the fastest possible time. The team time is taken from the time the first boat starts to the time the third boat finishes - but there's a 50-second penalty if the third boat doesn't finish within fifteen seconds of the first. Team racing means working together, co-ordinating movement to stay close together. Good teams interweave on upstream gates. Most people treat the team competition less seriously than the individual competition and have a lot of fun doing it. In Premier Division and International racing there are strict rules about the length, width and minimum weight of your boat (see below) but you can use any kayak to start with. When you want a "proper" slalom kayak, buy one second-hand - you will often find them for sale at competitions. A slalom boat is light, long and low so that it can pass under the gate poles. You need a paddle and a spraydeck, and you must wear a buoyancy aid and a helmet. Other equipment - wet shoes, shorts, a cagoule - you can get later. There are no restrictions on what boats are made of, but in practice carbon fibre and resin, and sometimes kevlar, are the best materials to build a boat this light and strong enough for the job. Boats may weigh as little as 7 Kg and carry a lead weight to bring them up to regulation weight. Using a weight placed at the centre of the boat keeps the ends light so that the boat turns fast, and it is allowed as long as it's permanently fixed into the boat. Just go along to any "Division 4" event, find "Control" and ask for an entry card. You will be welcome! If you like you can get your entry in before the event: if you've got one, send an entry card to the address in the Calendar - or just write. You also need to send a cheque or postal order for the entry fee - £5.00, or £10.00 for a double event. If in doubt, pay on the day. You have to be a member of British Canoeing/Canoe Wales/CANI/SCA to race, but for a Div 4 race you can buy a one-day temporary membership. Once you win promotion to Div 3 you must join. Competitions are held all over the country from March to October. Click here and then select Div 4 for a Calendar of Races for Newcomers. You start in number order. Watch others at the start, and be there when your turn comes. Try to get through all the gates - in the right order! When you've finished, wait for two more people to finish before you get off - it's your turn to do safety duty. The seat of my kayak was the only comfortable thing in the race. I felt scared, nervous but also excited. My last practice was the best so far, it had left me feeling exhausted. Would I finish the race? Ahead of me I could see the first 10 gates and round the corner were the other 8 gates. The white foam of fast flowing water and a great challenge lay ahead. My fellow Matlock Canoe Club members were standing nervously at the side of the riverbank. I could hear them frantically cheering me on and this made me feel better and the water was flowing past my boat and down the river. At that moment, it happened – the countdown: 60 seconds, 30 seconds, 15, 10, 5, 3-2-1 –GO! The first 10 gates were easy but, I was worried that I would fall in the river. Each time I approached a gate I could feel the water splashing up from my paddle and I could hear it more loudly as I rushed down the river. As I approached the last 8 gates, my arms felt like they were about to drop off. I could not think about anything other than finishing the race. I struggled to keep going and I made a mistake; I leant upstream when I should have leant downstream and the water started to flood into my cockpit. I had to finish with my half drowned boat. I swam through the last gate taking my kayak with me. I felt worried that my team members would be angry with me but they said that I had done fantastically for my first event. Despite my failing to finish I enjoyed the race. Kayaking keeps me fit and healthy. I have improved a lot since then and now I don’t know why I felt so scared on my first event. I would recommend kayaking to anyone. It is a really enjoyable sport. Cards will be carried to events by Alison Setchell, Colin Woodgate, Dave Royle, Andy Grudzinski and Chris Baillie. You can also get entry cards by sending a stout, stamped, self-addressed envelope 9" x 4" or larger to Mrs S Paterson, 14 Clay Street, Wymeswold, Loughborough LE12 6TY. She will send you as many entry cards as the postage will cover. Slalom paddlers are grouped so that they can race others of similar ability, on water that is appropriate to their skill. There are five divisions - Premier and Divisions 1 to 4. Newcomers usually start in Division 4. When you do well, you get promoted. You build up your skill, and work your way up to bigger water and tougher competition. In Division 4, where you start, it won't be too hard - a rush of water from a weir, or moving water in a stream. When you get to Division 1 it will be big and tricky! In C2 there is only one combined division, but new pairs can race at Div 2, 3 and 4 competitions. I'm already an experienced paddler. Do I still have to work my way up the divisions? 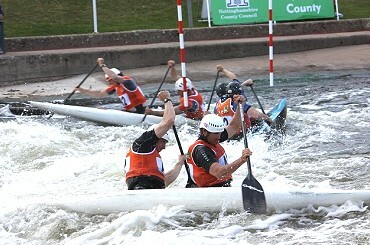 Organisers try to use sites and set the gates at a level of difficulty to suit paddlers in the Division that's racing. In Divisions 2, 3 and 4 some races are "multi-divisional". You can expect the course to be set for the higher division racing, so Div 3 paddlers can expect to find a 2/3 challenging. You may prefer to pick races that are for just your own division, or yours and one down, to start with - but if you like bigger water and enjoy a challenge, go for harder ones! The best starting place is our welcome page. If you're not already a member of British Canoeing, the Scottish Canoe Association, Canoe Wales or the Canoe Association of Northern Ireland, you need to join first. Then register and apply for a bib, using this form. Fill in the form, print it, sign it (if you're under 18, get a parent to sign it too) and send it off to the Bib Officer for your class with your British Canoeing / Canoe Wales / CANI / SCA membership card, a £10 cheque made out to British Canoeing Slalom Committee and a big, stamped addressed envelope (see below for postage). The Bib Officer will allocate you a number and send you the bib. The Bib Officers' names and addresses are on the form. If you are already in Division 3 or higher, you are promoted when you've achieved three wins or the points target (see how do I get promoted). A bib number in your new division will be issued automatically, and you can use the online entry system at once for races that offer it. A large, strong stamped, addressed envelope with postage for 150g. If we can squeeze the bib into the large letter format the price is £1.50 1st class, £1.32 2nd class. You can apply to be put straight into a higher division, but you'll need to show some evidence of your ability. One option is to go to a Division 2 race, enter as an "Open" competitor or judge and show your result as evidence. Contact or use this on-line form to apply for reinstatement. If you've been ranked before you mustn't race in Div 4 - sort out your ranking with John Woods and return in a suitable division to suit your ability. If you're already ranked in another class - say, you're a Div 1 K1 paddler wanting to do C1 - rank yourself in the next division down (so a Div 1 K1 races in Div 2 C1, and so on) but you must apply for a bib in the new class as soon as possible. If it's C2, you and your partner can just get together and race at any Div 2, 3 or 4 event: apply for a bib and you can enter a race at any level. People sometimes decide to enter a race on the spur of the moment. If you explain to the organisers they'll usually let you enter as above, in an open event or as a judge. Keep track of your points from the results, or on the website ranking lists. You count the total of your best five scores, and you get promoted when you've achieved three wins or the points target (see how do I get promoted). Write to your new Bib Officer and send in your old bib and another big, stamped and addressed envelope - see what to do if you get promoted. At the end of the year, paddlers are ranked for the next year according to their points, and they get a new bib number. Send in your bib to your Division's Bib Officer by 30th November with a stamped, addressed envelope (a small one will do). The Bib Officer will send you a bib voucher. How do I get my new bib at the start of the year? A big, stamped and addressed envelope. Bib Vouchers are valid for two years from the date of issue. If you want a refund of your bib deposit, complete the voucher with your address, and send it (with a stamped, addressed envelope) to the Slalom Treasurer, Hazel Ridge, Faenor, Bethesda, NARBERTH SA67 8HW. If you want the cheque made out to a person other than the named paddler, please include a covering letter. A bib can be posted as a “large letter” for £1.50 (first class) or £1.32 (2nd Class) BUT the envelope must not be bigger than 353mm x 250mm and it must (easily) go through a 25mm slot. A lot of clubs have training nights and welcome beginners. Click for a list of clubs that are active in slalom. You have to be a member of one of the British Canoeing national canoeing organisations (British Canoeing, the SCA, Canoe Wales or CANI) to race, but for a Div 4 race you can buy a one-day temporary membership. Once you win promotion to Div 3 you must have full membership of one of the above to race. Div 4 Under 18s - if you are taking a group to an event and take your club’s affiliation card or a copy, and providing each competitor is a member of that club and can show a club membership card or other proof of membership, they are covered and do not have to take out Event Membership.